Timing is everything in sports. It can also be crucial in writing about sports. When Greg Prato conceived “The Seventh Year Stretch: New York Mets 1977-83,” his latest oral history of a Big Apple franchise, the team was in the doldrums, suffering from both losing records on the field and an image of a team in the country’s largest market unwilling to spend what it took to compete. As it was coming out, the Mets were coming on strong in the second half, creating drama with the addition of Yoenis Cespedes and the drama surrounding how many innings Matt Harvey would pitch, that culminated in a surprise trip to the World Series. What’s interesting is that the author chose to feature another unsuccessful period in team history, a time frame during which the Mets had nothing but losing records. One reason is that it also was a time during which several moves were made that led to the 1984-90 epoch during which the club finished first or second every season and won the 1986 World Series. Back in April, I reviewed Steve Kettmann’s biography of Sandy Alderson, “Baseball Maverick: How Sandy Alderson Revolutionized Baseball and Revived the Mets,” for The Wall Street Journal. The book was well-researched and well-written, but also struck me as strangely worshipful of Alderson — in a way that even Alderson would resist — occasionally dismissive of modern analytic baseball thinking and, more than anything else, a little presumptuous of just how great a job Alderson had done with the Mets. The first sentence of the review: “There is a chance the New York Mets will not be terrible this season.” The presumption was clear: Why write a book about this team? So! Here we are, with Game 3 of the National League Championship Series at Wrigley Field Tuesday night, with the Mets two games away from their first World Series in 15 years. So perhaps it was in fact worthwhile to write a book about this team and this general manager after all. Kettmann, graciously (considering how I panned his tome), agreed to answer some of my questions about this year’s team and Alderson’s legacy. 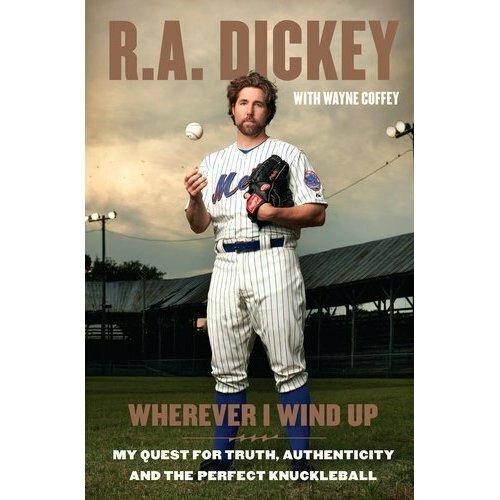 “I like adventure,” R.A. Dickey writes in his book Wherever I Wind Up, which hit bookstores on Thursday. He is talking on page 289 about spending part of his first Mets season in 2010 at a condo in Greenwich, Conn., belonging to former Met Shawn Green.